There is a study in psychology that addresses how people react to certain colors and how particular colors evoke certain emotions from the person viewing them. This psychology has been used in everything from movies to advertisements to cartoons. Read on to find out how color can change our perception of people and things. Any marketer understands that certain colors evoke natural knee-jerk emotions from people. This isn’t really something you can control, and a large part of advertising is manipulating the viewer’s feelings. Choosing the right colors for your brand identity can help nudge people to be more interested in your product or trusting your products more, especially when your employees are wearing uniforms to match your brand. There are some common colors that you can be inspired from if you are designing your brand or considering which colors to use when it comes to your employees’ uniforms. · Red is typically associated with urgency and can have a stimulating effect on the viewer, but its association with aggression can stimulate feelings you may not want. · Green is typically associated with health, nature and tranquility. If you choose green for your uniforms or branding, you may be likely to bring out a trusting and calming effect. · Black is associated with authority in people’s minds. Black also can bring about thoughts of stability and power. 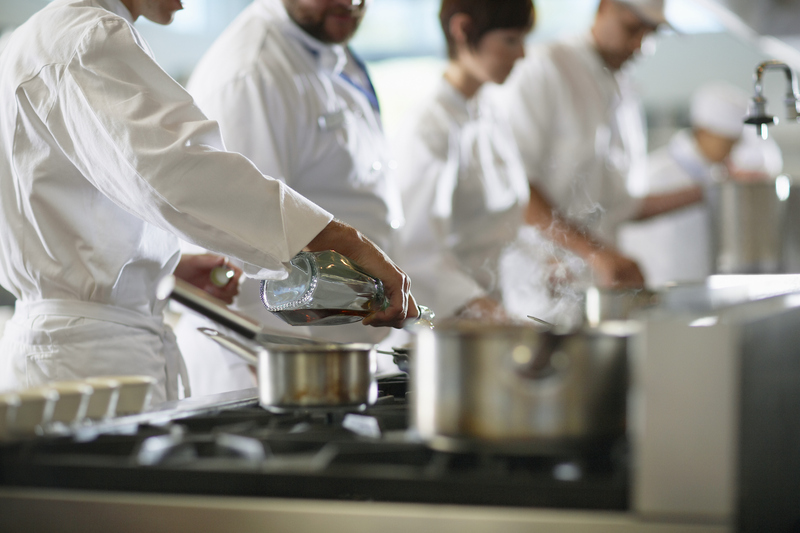 A traditional chef’s jacket typically consists of a clean and crisp white jacket with a matching hat. According to the psychological studies noted above, the color white can bring about feelings of purity, safety and cleanliness. Long before the psychological studies came to be, white has been associated with purity, and so chefs have always worn white jackets. This makes sense because the absence of colors or any discoloration can be easily noticedon a white shirt. For a chef who is handling your food and is entrusted with your health, white helps bring a sense of trust in their cleanliness. White’s inability to hide marks can make a chef seem more trustworthy as they are not trying to hide any mistakes or stains. While not all chefs wear white uniforms, it is fairly common and it all has to do with the psychology of color. To begin designing and assessing your uniform needs, contact Chesapeake Uniform and register to rent or purchase uniforms for your company. We have served in the Mid-Atlantic region for over 30 years and our quality is unmatched. Give us a call at 410-558-3360 or visit online to let us know what we can do for you. Be sure to stop by our social media pages to view examples of our work and more services provided on Facebook, Google+, Twitter and Pinterest.